It's weekly wrap up time again - where did this last week go? I did a lot of social running this week and absolutely loved it. I'm glad I'm finally meeting people in the Bay Area and running with them, it took me a long time after moving here. As an added week highlight, I did two trail runs and I'm loving it. More of this to come I'm sure. Here was the week. We did our long run on Sunday this week instead of Saturday because we were out in Napa and it was so hot there. This one was on Sawyer Camp Trail near San Mateo, where the weather was cooler and quite nice. I felt like I started slow but was very happy with the pace of this run overall. 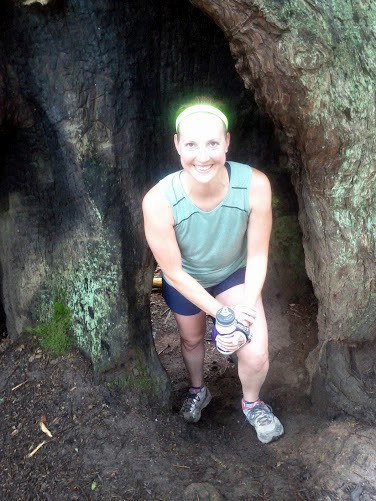 I ran with a Ragnar teammate after work and had a fun time talking to her; I hadn't met her before. Our pace ended up being really well matched, and we did her plan for the day of running for 1 hour total. We started from Google campus and ran on the Bay Trail. Because I ran longer the day before, I did my shorter run this day. It worked out well because it was run club day and I ran with my friend Katie. Another great social run! We stayed at Rock Bottom for the beer and appetizers after and met a few new runner friends. 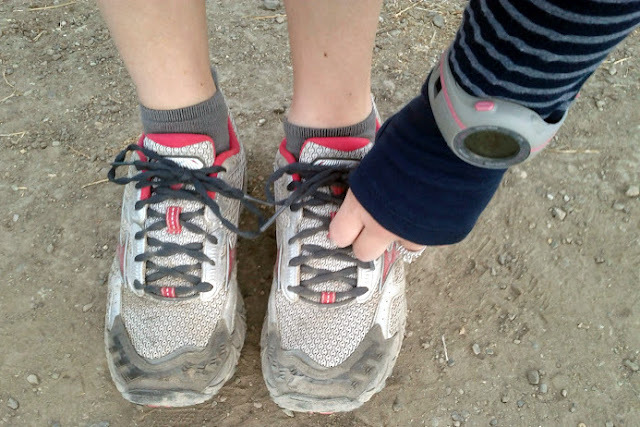 I don't generally run 4 days in a row, but I wanted to do a trail run with Alisyn so I did. My legs felt tired, but it was really ok and I believe good for me to run on tired legs. We went running at Quicksilver in San Jose, very hilly and great views at the top. I finally decided I need new trail shoes after this run and ordered the Brooks Adrenaline ASR 9 (trail version of my shoe) this week. These Mizuno guys are years old, a little narrow, and have enough mileage on them to be done, but I had stopped using them when we moved from Michigan and never replaced them. I was also excited for the cool morning weather to break out my Oiselle long sleeve stripey tee! Super soft and comfy. Swapped days to run trail on Wednesday. I went to the morning strength class which I love, especially because the instructor focuses on single leg exercises so one leg can't mask something for the other. This was a seriously tough trail run, so I'm counting it as the long run this week due to time on feet. Husband and I wanted to get out of San Jose for the day, and we headed up to Marin County to run on the Dipsea Trail. 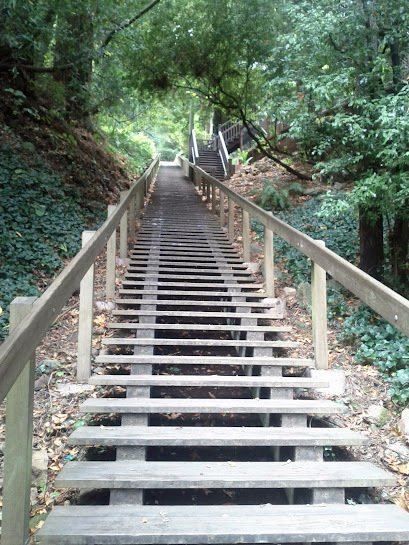 It starts off with tons of stairs, and it's overall a very hilly run. I love the scenery and being on the trail! I also think the distance here might have been off. We got lost trying to find the trail head after getting up the stairs, and my watch read 1.25 miles when we started the trail. 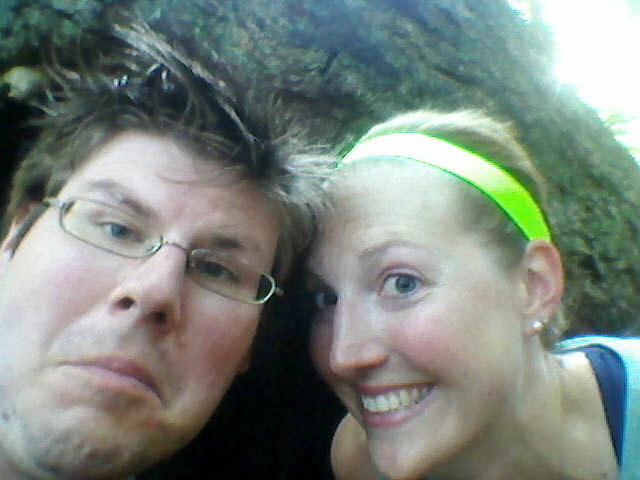 We went to mile 5 of the trail, then turned around and ran it backwards. I thought this would be a little over 11 miles by the end (10 being on the trail itself.) I've been told that switchbacks can sometimes shorten GPS watch distances on the trail, so maybe that's what happened. Or maybe we only ran 10.25, and if so then that'll be ok too. I actually took my phone, so here are a few photo highlights of the weekend run! Part of the staircase to the trailhead. 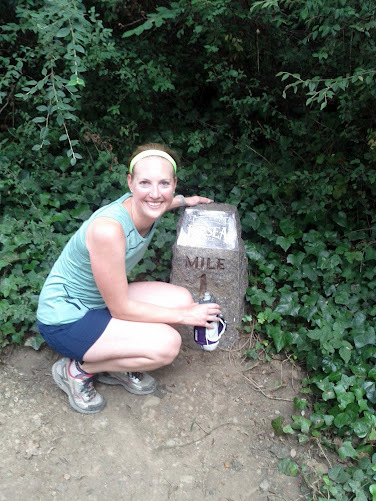 Dipsea Race mile marker 1. Going up the long hill after passing the Muir Woods parking lot. Very long uphill. Me in the big tree. Whoa bright headband! Near our turnaround, in the fog at the top. Gorgeous! Dipsea Race mile marker 5, our turnaround. You guys look like you had a great time on your long run! I am a lil jealous that hubs runs with you, although J and I are starting!! The dipsea is a famous trail! So cool you got a chance to check it out! 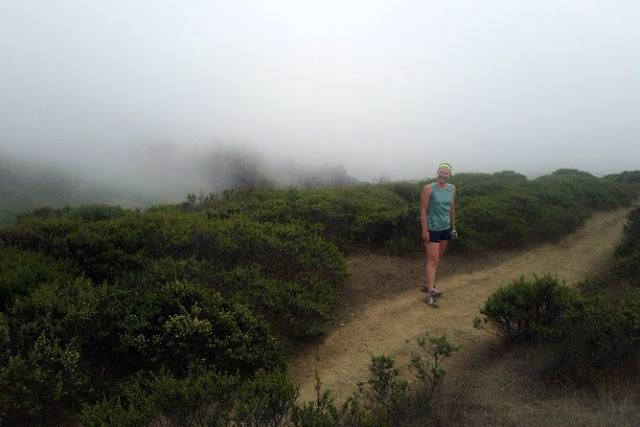 Sometimes I am just jealous of all you bay area runners - there are SOO many great trails in the area. I'm only beginning to explore trail here and it's definitely amazing, I feel really lucky. It's really strange after living in the midwest until last summer and I love living here! Eeee so happy you got to run at Dipsea! Trail run this week? I'm dying to start exploring trails in the Bay Area. Let me know if you want to do an East Bay run! Um, yes I'd go on an East Bay run! Tweet or shoot me an email sometime - sojustkeeprunning@gmail.com . I met a few people from Twitter in person at race expos, some at work from Ragnar team, and randomly one of them on an airplane! Katie (met on airplane) found the run club on Tuesdays and now we both go to it. Have you tried any of the Running Fit groups? I only went a couple of times, but people there seemed nice. 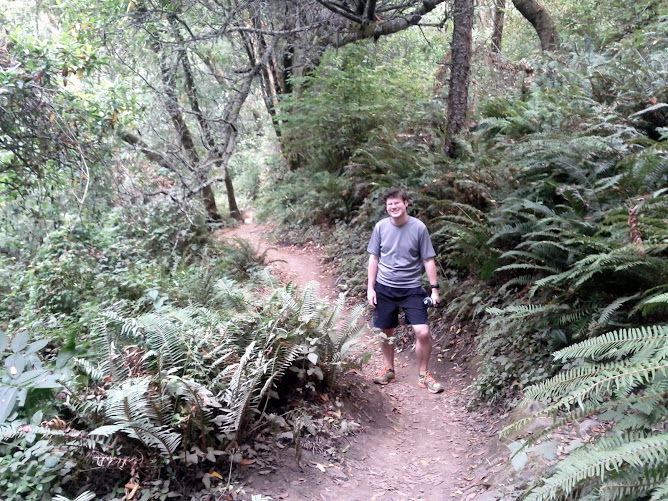 I attempted to run part of the Dipsea Trail with friends a few years ago. We couldn't find the trail (part of it was closed at the time and we didn't know the detour) so we just ran on another trail. I'd love to try it again one day. I am backtracking from your previous post.... that looks so gorgeous! 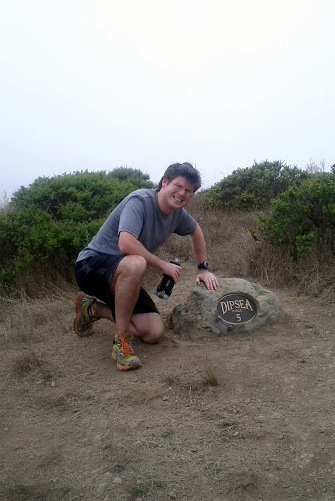 I need to run Dipsea! Twins! I just got my blue stripey tee (darn it, still to hot to wear it), and I wore the same green shirt blue roga combo today. Great workouts! The fog up during your run would be very cool. That green shirt/indigo roga combo is my new favorite! I love how the stitching matches.